We have a title, folks. And, as it so happens, a title page! That's the white one you see on the left there, the right side will be the design on the hard cover...if I get my act together and order a Blurb book before the show. Oh, I have a real cover too, but I think I will wait to show you that one until I reveal the book in its entirity. Why Swimmer Girls, you ask? 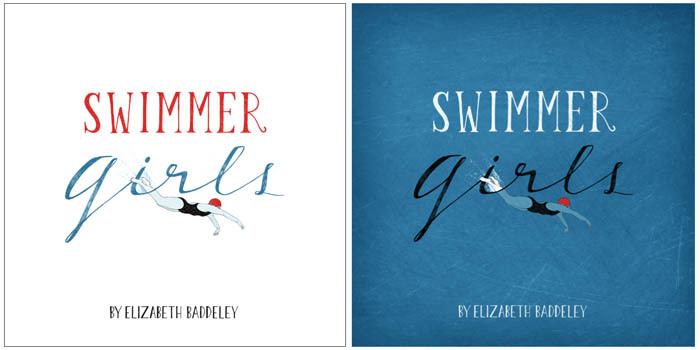 Well, other than the fact that that's what I initially named my very first desktop folder for this project, "Swimmer Girls" is what we, ahem, swimmer girls, were referred to in high school. I think it was mostly to distinguish us from the "Soccer Girls" when they snuck into our locker room with dirty cleats making a muddy mess for us barefoot swimmers to trudge through. Swimmer Girls and Soccer Girls were buds in the classroom, but in the locker room...it was war! But I digress. The name Swimmer Girl brings back great memories to a time when I was young, naieve, driven, and becoming the person I am today.